Suddenly, recycling is costing cities and towns across Connecticut money. The Connecticut Conference of Municipalities reported that China Sword – China’s new policy of refusing United States’ plastic and paper recyclables – has flipped the economics of Connecticut’s residential recycling system. There are many steps that municipal and state governments can take to achieve a less expensive and more environmentally sustainable solid waste system. An immediate first step should be to amend the Connecticut Bottle Bill to help reduce the municipal cost of collecting and processing recyclable materials. We can get there by 1) Increasing the bottle and can deposit value to ten cents; and, 2) Expanding the bottles and cans accepted to include more non-carbonated beverages, wine, and spirits bottles. Right now the Bottle Bill puts a five-cent deposit value on carbonated beverage containers (like beer and soda), and noncarbonated beverages like water. Bill No. 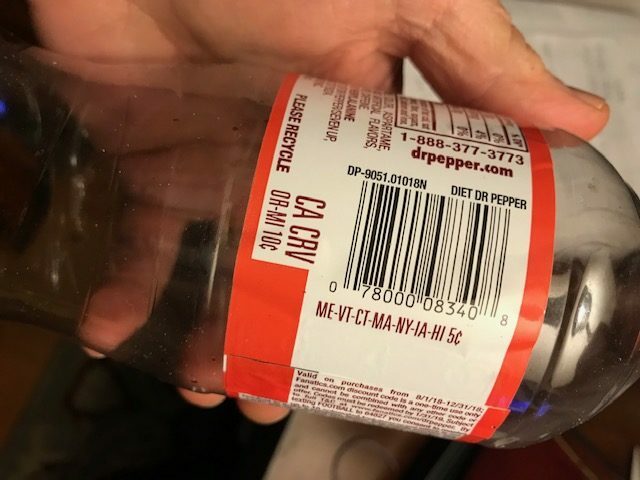 7294, “An Act Concerning Bottle Redemption in the State,” would add juice, tea, sports drink, and energy drink containers to the existing bottle bill, and increase the deposit value from five to ten cents. Simply put, higher refund values lead to higher redemption of containers, and more recycling. The State of Michigan has a ten-cent deposit/refund value, and, not coincidentally, the highest overall redemption rate in the United States, at 92 percent in 2016. In contrast, Connecticut, which had an 88 percent redemption rate in 2001, had a redemption rate of 48.5 percent in 2016, one of the lowest in the country. If Connecticut increases the deposit value to a dime, more bottles and cans would be redeemed, so they would be less likely to end up in people’s curbside or trash bins, which municipalities ultimately pay to collect. The governor’s 2019 draft budget also proposes adding liquor and wine bottles to the Bottle Bill. This would not only reduce the weight (and related expense) of curbside recycling significantly (glass is 25 percent of the weight of Connecticut’s recycling stream) , but would also largely remove glass from single stream recycling. Single-stream glass inevitably breaks, destroying the value of recyclable material like paper and cardboard. The more glass is removed from curbside recycling, the more value the cardboard and paper in the bins would have, and more money that cities and towns would save. If Connecticut wants to cut disposal and recycling costs, and if the state wants to increase redemption rates, and improve the quality of recyclables to avoid prices tanking in the future, the Bottle Bill is one of the best tools we have. It’s past time to update the Connecticut Bottle Bill to our modern era. And Connecticut’s cities and towns can’t afford to wait. Kirstie Pecci is Director of the Zero Waste Program of the Conservation Law Foundation.